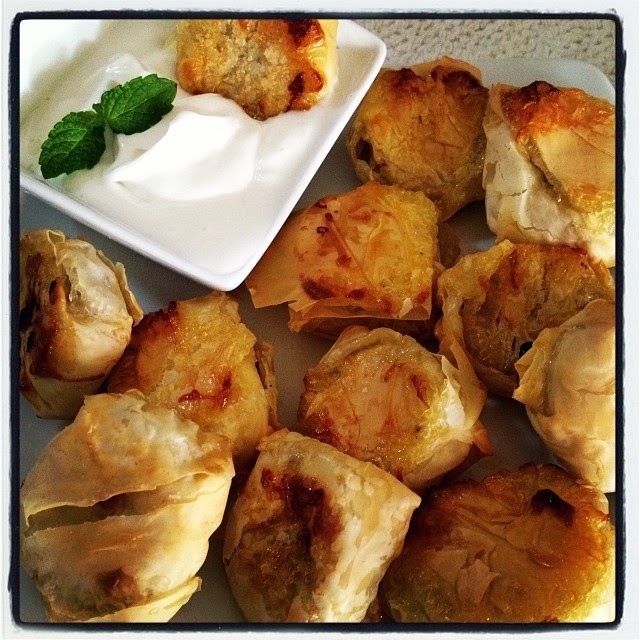 Healthy, Busy Mom: Just for Kids: Fun with Phyllo! 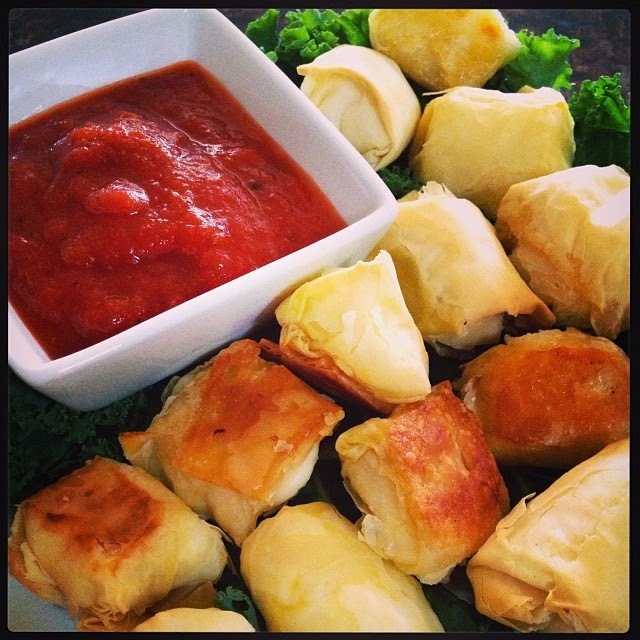 Just for Kids: Fun with Phyllo! When my family and I are craving everything deep fried and dipped in sugar, phyllo dough is always there for us. It can be hard to work with if you don't follow the directions, but as long as you keep it fairly moist, you can wrap and bake just about anything! I did two recipes today with one roll of dough, and still had a bit to spare. With the mozzarella bites, be sure to seal the dough up, or the melted cheese will melt out the holes. Bodhi liked the leaky ones though, and went for those first! Follow the directions for preparing the phyllo dough (remember it must be kept moist to prevent cracking and breaking). Using a large knife or pizza cutter, section the phyllo dough into 9 even squares (cut twice horizontally into thirds, and vertically twice into thirds). Place a mozzarella bite into the center of one of the squares. Using about 3 sheets of dough, wrap the corners and edges around the piece of cheese. Seal the edges with wet fingers and place the sealed bite onto the cookie sheet. Repeat with the other bites of cheese until all are coated and wrapped. Save the rest of the phyllo dough for the next recipe. Spray the stuffed bites with cooking spray and bake in the oven for about 7-10 minutes, until golden brown. Remove from heat and transfer to a serving dish. Serve with warm marinara sauce. Place a banana piece into the center of one of the squares. Using about 3 sheets of dough, wrap the corners and edges around the banana. Seal the edges with wet fingers and place the sealed bite onto the cookie sheet. Repeat with the other bites of banana until all are coated and wrapped. Spray the banana bites with cooking spray and bake in the oven for about 10 minutes, until golden brown, flip them over and bake an additional 5 minutes. In a cold mixing bowl, combine heavy cream and stevia or sugar. Mix on high speed with an electric mixer for about 5 minutes, until stiff peaks form. Add the coconut cream and mix again just until combined. Optional deliciousness: Also add 1/4 cup lemon curd and mix just until combined.